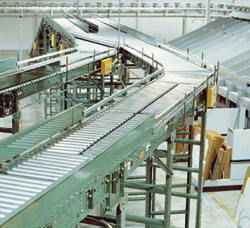 One size doesn't fit all, especially when it comes to conveyor systems. That's why the first thing we do is ask questions. Not just lots of them, but the right questions. We want to understand the nature of your needs so we can create the best possible solution. We'll learn your processes, identify the challenges, and help you turn them into competitive advantages. Meeting objectives through partnership is what we call it, and it's one of our core principles. The way we add value is a melding of what we've learned about you, and what we know about conveyors and integrated systems into a system that gives you a competitive advantage. Before there is a CAD drawing made or a file touched, we've got a clear picture of your vision for the project--what you want to accomplish, how you'd like to improve. It's time for nuts and bolts. Determining what equipment you need and how it fits into your process is what we do. We've got the answers. We supply CAD drawings, specifications, parts lists, justifications, and more. It's all the what's, who's and how's involved in creating your world-class conveyor solution. It's a time where the plan is refined and all the details are in play. Especially when time is a critical factor--and it often is--the development of an accurate, timely schedule is crucial. Cisco-Eagle believes in defining that schedule accurately and quickly, then adhering to it tightly. It's time for the vision to become reality. Time for drawings and ideas to become rollers, belts, steel and bolts. World-class implementation involves much more than a precise, on-time installation. It involves debugging a system, training your people on its best operations, and making certain all the details are taken care of. We go to lengths to match your vision and improve your operations. We make your life easier after the system is installed. The way we do business is partner-oriented, meaning we aren't going anywhere once the hardware is installed, debugged and working. We offer maintenance services and training to our customers to make sure the ride is smooth.